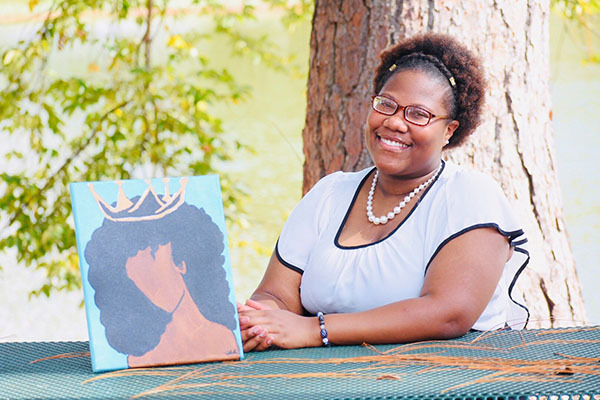 Zakeyia Westberry, an education major and member of the Cochran Campus Activities Board, recently published a book of her poetry. Full Name: Zakeyia Yakirria Westberry. High School: Northside High School where she was FCCLA secretary/treasurer and a member of the National Technical Honor Society and school chorus. Family: Mother, Andrea McCoy; sister, Alaysha Westberry; niece and nephew, Autumn Tharpe and Karter Tharpe; grandmother, Bernice Jones; and goddaughter, Kamryn Dodson. Employment: Sodexo- Georgia Hall café on the Cochran Campus, RA for Gateway Hall. Degree Objective: Bachelor of Science in Elementary/Special Education. Activities: Campus Activities Board member. The greatest thing she discovered about Middle Georgia State was … “There is something here for every person. The diversity of this University is out of this world. So many ethnicities, personalities, ages, and cultures working together to strive towards greatness is wonderful. MGA also motivates its students. My advisors pushed me to complete my poetry book, ‘Proverbs of Zakeyia: Royal & Chosen.” They had hope in my ideas and future. Now I am a published author at the age of 20, and my book was released December 5, 2018. MGA pushed me to seek out leadership positions, including being an RA and a member of the Campus Activities Board.” Westberry recently donated a copy of her published book to Roberts Library on the Cochran Campus. that as far as we can determine, you are the first currently enrolled student to submit a publication for inclusion in the Middle Georgia State University Roberts Memorial Library collection.